The Good: Corvallis, Oregon - The Oregon State Beavers came into this game as vast underdogs when you consider that their opponent was the ranked Stanford Cardinal. The Beaver's season was looking like a train wreck, but that did not discourage them. They came into this game 2-5, but would be leaving their home stadium with a win. It was all thanks to their outstanding defense and exceptional quarterback play by Cody Vaz who threw for 297 yards and 2 touchdowns. Both teams traded touchdowns in the first quarter, but the Cardinal offense soon went stagnant until the fourth. Cardinal quarterback Kevin Hogan never looked like he had his head in the game and made a crucial mistake that resulted in an interception. The Beaver offense remained poised and went on to score a touchdown in every quarter. Stanford managed to score twice in the fourth quarter, but it was too little too late as they brought the game within a touchdown 28 - 21, but with only 9 seconds left in the game. The Beavers got the ball and ran the clock out to complete the upset. With this win, OSU puts another much needed win in the books and moves with a new found confidence to face USC next week. Stanford can only reflect about this loss as they head into a bye week where the coaching staff will have to single out what went wrong with their offense and fix the problem any way they can. The Middle: Boulder, Colorado - The matchup today at Folsom Field seemed to favor the undefeated #3 Colorado Buffaloes as they took on the 4-2 Arizona Wildcats. No one expected the game to become the shootout that it did. The highly ranked Buffalo defense could not find a way to stop the Wildcats offense. They managed to snag an interception in the first quarter that put them ahead 7 - 0, but after that both teams began to just trade touchdown after touchdown. Colorado went into the half with the lead 17 - 7. The game seemed to be in the Buffs favor as many believed it would, but the Wildcats came out of the locker room a completely different team. They abandoned the running game and took to the air with passes to the backfield as well as downfield. The Buffs rush defense was solid, but their secondary was picked apart by Jesse Scorggins who soon mounted a comeback for the Wildcats. The fourth quarter began with the Buffs up 24 - 21, but that would not last long as Arizona kicked a 37 yard field goal to tie the game 24 - 24 with under 4 minutes left. Shane Dillon, who had played exceptional all game, led the Buffs offense out to complete a game winning drive. The Buffaloes game plan was to march slowly downfield and use up most of the clock before scoring, but it fell to pieces as the young gun quarterback dismissed the game plan and threw a 20 yard touchdown pass to his tight end Vincent Hobbs with over 2 minutes left in the game. Arizona had the shot they needed to get back into this game and head to overtime if they could march downfield and put one more in the endzone. Scroggins hit open receivers left and right until they soon reached the redzone. on a 3rd down and long with 16 seconds left in the game, David Richards broke open and caught a pass to tie the game up 31 - 31. Overtime was inevitable. Arizona started on offense and soon scored a touchdown on a 7 yard pass to Austin Hill. Colorado answered back twice, first to tie the game and the second to put them ahead 45 - 38. The pressure was on Arizona to deliver another touchdown and send this game into triple overtime. Scroggins led the offense on the field and on his second play, he found his tight end Michael cooker for a 25 yard touchdown pass to make the score 45 - 44. It seemed as though the fans would be seeing a triple overtime until everyone realized that the Wildcat offense was staying out on the field. They would go for the 2 point conversion to end this game here and now. Scroggins hiked the ball and threw a dart in-between two linebackers that was caught by his receiver to convert. The game was over, Arizona had pulled off the upset. The Wildcats now have 2 back to back OT wins over tough opponents which has made a statement to the rest of the Pac 12 division, "We Are Still Here". Colorado must find a way to bounce back after this heartbreaking loss if they wish to find themselves in the Pac 12 title game that, a week ago, seemed so close. The Bad: Eugene, Oregon - UCLA can not seemed to find a break after another loss this week against the Oregon Ducks. It was a slugfest that the Bruins were never part of as the Ducks were merciless with their explosive offense. Marcus Mariota was on target all game as he threw 12 of 13 completions for 187 yards and 2 touchdowns. 3 different Oregon players found the endzone on the ground while the Bruins running game never got going. They were kept to under 30 yards rushing all game which soon made their offense very one dimensional, the enemy of a great coach. Bruins quarterback B Hundley had his worst game of the season as he managed to throw 4 interceptions. The game itself was not out of hand when halftime arrived as the score was 12 - 21 Ducks. Soon after though, the onslaught of offense began and the Bruins could not weather the storm that is the spread option offense. The Ducks put up 20 points in the 3rd quarter alone and another 7 in the 4th to put the game out of reach as time winded down. 48 - 19 was the final score. This has been a rough start to the new coach of the UCLA Bruins career in the Pac 12 who is now 1 - 2. It was a tough game to be witness to as the Bruins were ranked #2 in the nation just over 2 weeks ago and are now sliding down the poles at a tremendous speed. If he can not find a win soon then who knows where the Bruins will be at the end of the season. The Bruins will get their shot at redemption as they take on the Colorado Buffaloes who may be feeling a little downtrodden as they lost for the first time this week. One thing is for certain, it will be an important game for both teams. 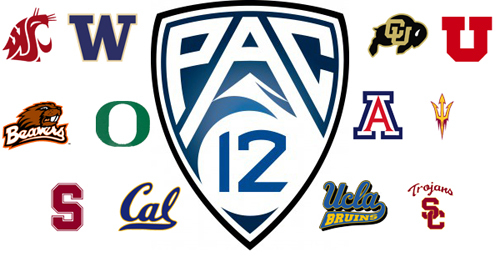 Game Of The Week: Los Angeles, California - The votes have been counted and this week's game of the week is the Pac 12 south division matchup between the #7 Colorado Buffaloes and the #11 UCLA Bruins. Both teams are coming off losses and know that a loss here may just about end their hopes of reach the Pac 12 title game. We are sure to see an interesting game as both teams will lay it all out on the line to get the win. The Bruins come into the game with a highly touted offense that proved to be stagnant last week. The Colorado Defense will try to replicate that game and keep the Bruins one dimensional. This game may just come down to whoever makes the most of their opportunities and has the least turnovers. The widely respected Kirk Herbstreit has put his stamp on UCLA for the upset and the Buffaloes will be using that as fuel to prove him and other experts wrong by righting them off. Nice job once again my friend. By the way I was able to make the game a 21-19 for like 2min lol. It feels like this GOTW is a curse for me right now but hopefully i can break that against you but it wont be easy!! Don't worry shady23, I will be in the Bad column this week. Jettwing wrote: "We Are Still Here"
eyeofthehawkeye2 wrote: Don't worry shady23, I will be in the Bad column this week. At least when we get our asses handed to us we don't disappear from the forums or run and quit like I have seen so many people do in the past. But I changed my entire offensive and defensive scheme I have been working on today but we will find out if it actually works later tonight.